Ensures proper hand positioning for more consistency and roll. Provides proper wrist support. Outstanding comfort and durability. Velcro straps for easy adjustment. Fast removal for spare shooting. one ot things i like is the simplicty of use. By Di from Staten Island, N.Y.
Used once then left at bowling center. Never got it back?? By Braz from Tomah, WI. Has improved my average by 20 pins. There is only a medium and a large....was there ever a small? 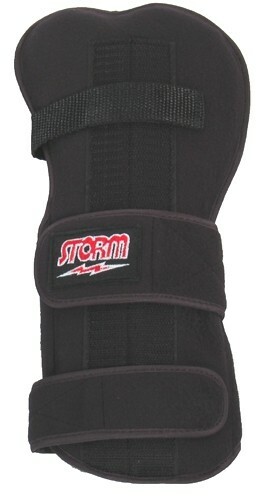 Due to the time it takes to produce the Storm Xtra Roll Wrist Support Right Hand ball it will ship in immediately. We cannot ship this ball outside the United States.